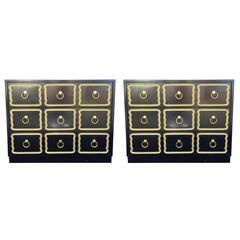 Pair of matching Dorothy Draper style Espana dressers in the iconic black with gold trim. Features brass hardware and dovetail jointed drawers. Good vintage condition consistent with age. Pair of bamboo nesting tables by Dorothy Draper for Heritage. Solid wood construction. Structurally sound, with minor imperfections to the finish (see photos). Exceptional three-drawer black lacquer dresser with carved, gold leaf detail and brass pulls. Designed by Dorothy Draper for Heritage Henredon. A three-drawer ebonized and parcel-gilt Dorothy Draper España dresser. In fine condition, recently painted and polished. 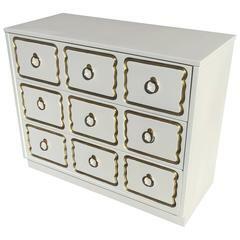 Espana chest of drawers in cream lacquer and gold by Dorothy Draper. 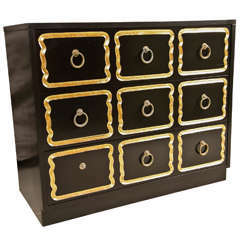 Black lacquered finish with three pull out drawers, gold trim and original gold pulls.